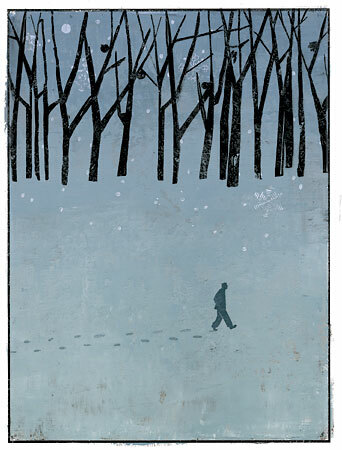 Hadley did this illustration for an article written by Sam Lipsyte and published by the New York Times. The article is called The Gift and it’s a tough read, but probably most appropriate during the time of year when we consider what really matters in our lives. In the story, Sam recalls the time he spent caring for his mother as she was dying of cancer, and spends time expressing regret over the time he lost, and perhaps, in his own way, committing himself to caring more in the future. I think hadley’s piece catches the sprit of this most precious realization, and beautifully ties it to shortest days of the year. Time is the most valuable gift any of us has, and what we do with that time is the most important choice any of us make.